Note: Many thanks to Ralph W0RPK for all the work on tracking these circumnavigating amateur radio balloon flights and providing updates to this page. As of the end of 2016, there were still several balloons in the air on multiple laps. The number of long duration balloon projects is increasing all the time. The workload on Ralph became too much. Therefore we have taken the decision not to continue to update this page. Now that the skills and experience has increased and the flights are more common, it is not practical (and perhaps not so useful to readers) to continue to update it ever more frequently! The page remains a testimonial to the pioneering work of the early circumnavigation balloon constructors and operators! 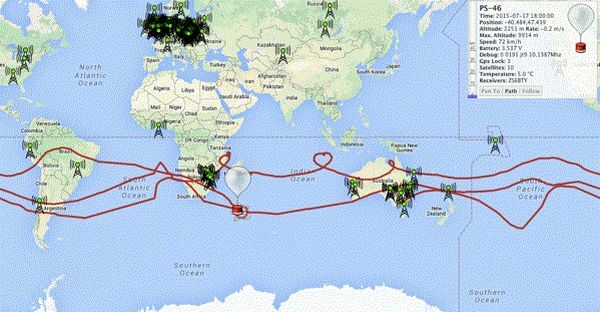 This article documents the amazing achievements of radio amateurs flying small "floater" balloons around the world. A circumnavigation is a complete trip around the world, passing the starting longitude. If the following list of flights is complete or inaccurate please email us!. This list was compiled by Ralph Wallio W0RPK who wrote this article for the QRP Labs website. (NOTE: The pictures are scaled to suit this article format. Please click each map picture for the full-size version). My introduction to what came to be known as Amateur Radio High Altitude Ballooning, ARHAB, was from Bill Brown, WB8ELK, and his high altitude ballooning presentation to the 1989 AMSAT Annual Meeting and Space Symposium (hosted by the Central Iowa Technical Society, CITS, in Des Moines, Iowa). Continuing to consider what Bill presented, in 1993 I attended a high altitude ballooning seminar in Denver hosted by EOSS, Edge of Space Sciences, http://www.eoss.org/. CITS then flew four HABET flights (High Altitude Balloon Experiments in Technology) later in 1993 and during 1994. Then HABET, with the assistance of the Iowa Aerospace Education Council, was moved to Iowa State University in 1995 with funding from the Iowa Space Grant Consortium. HABET continues today in the Aerospace Engineering Department (https://sites.google.com/site/cyhabet/about-us/history). A few years later, while hosting and maintaining ARHAB web pages, an unintended floater captured my attention. On January 8, 2000 Pete Sias, WB0DRL, launched a Sky Science Over Kansas (SSOK) high altitude balloon mission from Salina, Kansas. See http://showcase.netins.net/web/wallio/SSOK.html for the result when Pete's latex balloon refused to burst creating a 700-mile track. VE3KCL S-11 14-Jun-2016 First QRP Labs powered balloon circumnavigation! VE3KCL S-18 07-Oct-2016 Second QRP Labs powered balloon circumnavigation! 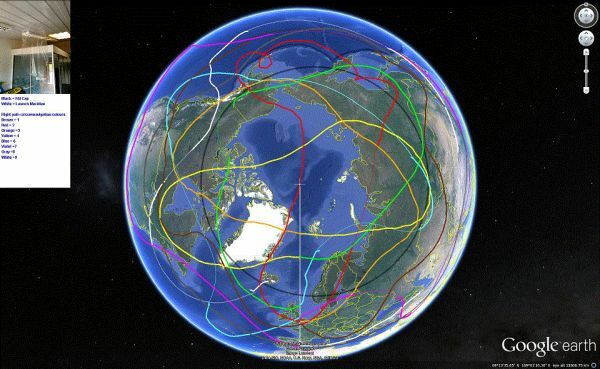 Following is a compilation of all known circumnavigating ARHAB flights which includes information contained in flight web pages and in telemetry archives (principally http://habitat.habhub.org/ and then http://habitat.habhub.org/ept/). Flights are listed in chronological order of launch dates. Please see given web pages for much more information including payload details.
" ... cold temp startup issue, sometimes they start up, sometimes (most) they don't." 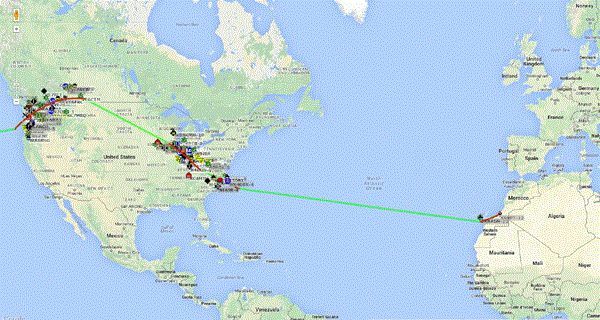 and " ... due to a mistake on my part, I forgot to start the script that takes the WSPR call and pushing it to APRS after I had done some other work on the script." 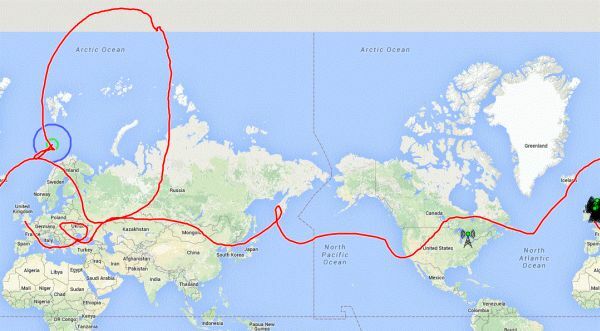 The strange shape of the map is explained by the last APRS reports of the balloon being north-east of Japan, then nothing at all over North America, until the balloon reached Europe again. So there are no APRS reports around the launch longitude but the balloon did pass it. This happened a second time with the 2nd circumnavigation.